While I am a “walk-in” and not incarnated upon this planet, the physical vehicle still holds memories of what has gone on before, in this lifetime and others. Esoteric teachings would call these “memories” part of the Akash for the soul who once resided within the auric field, the lower bodies of the light body. I’m specifically calling up the emotional memories and traumas experienced by my sister, Tazjma, as part of my “mission” in being here is to assist in clearing these up so she will not be compelled to reincarnate on this planet in the future. One of these memories stems from an event that hit worldwide headlines nearly forty years ago, the volcanic eruption of Mt. St. Helens on May 18, 1980. Since I’m still in recovery mode from another recent bout of “illness”, I have found myself watching YouTube videos. Since I can only take so much of political-related videos, I was watching some videos on backpacking in the West. And then, this past week, with all the volcanic eruptions going on in Hawaii, I found myself drawn to watching of videos of a lecture series by a professor, Dr. Zentner, who happens to work out of the Geology Department at my alma mater, Central Washington University, located in Ellensburg, Washington. These videos by Dr. Zentner were especially interesting to me as I had (or Liz as she was known in those days) hiked, camped, or backpacked over many of the sites being described in geological terms. Yesterday’s video, https://www.youtube.com/watch?v=MXEQeTg0Xww, “The Yellowstone Hot Spot and Liberty Gold”, was especially interesting as I’ve actually stayed in an old cabin in the tiny mining town of Liberty, located some 30 miles north of Ellensburg, on the east side of the Cascade Divide. The video covers the why and how’s of the line of volcanoes extending from northern Nevada to Yellowstone National Park… and what happened to the rest of the story. If you’re interested in geology, I would definitely recommend you take the time to watch this series. Anyway, with all the hoopla going on in Hawaii, it is good to note the difference between the volcanoes of Hawaii and the Cascades. The volcanoes in Hawaii are or have also been located over a “hot spot”, but due to the movement of Earth’s crust, the hot spot keeps moving. The big island of Hawaii is the youngest of the Hawaiian Islands and is made up of five (5) shield volcanoes. Currently, the eruptive process of the youngest of these volcanoes, Kilauea, is disrupting the lives and livelihoods of hundreds, if not thousands of people. A major steam/ash eruption is imminent to explode from the main crater at Halema’uma’u according to scientists. Yesterday, May 15th, a red alert for aviation traffic was posted, with a heavy ash cloud traveling some 30 kilometers away. And some 20 volcanic fissures are creating havoc in nearby neighborhoods. Still, this eruptive process is very different and instantly destructive as the volcanic eruption of Mt. St. Helens in SW Washington in 1980. The volcanoes of the Cascades are stratovolcanoes, who typically give off pyroclastic explosions rather than the slower basalt or andesite eruptions. Any of the currently active volcanoes, extending from Mt. Lassen in Northern California to British Columbia, Canada, are relatively short-lived, a mere two million years. And as they age, they tend to literally lose their tops. One of the oldest volcanic features in the Central Oregon Cascades, Crater Lake, is the site of ancient Mount Mazama. This volcano famously lost its head, with the ash covering most of Western United States (of today) towards the Mississippi River. One of the youngest of the Cascade volcanoes, Mt. St. Helens began to signal that something was up when a series of small earthquakes rattled the mountain starting in March 1980. By May, the beautiful snow-covered cone showed signs of swelling. An area of restricted entry was assigned by the governor of Washington, but it would prove insufficient when the volcano finally erupted. Many people (57 died) were caught by surprise, tourists, geologists, forest workers, and locals… by the explosion and later, the huge lahar (mudflows) that came down the Toutle River all the way past Interstate 5 (I-5) crashing through bridges and ripping roads and houses off their foundations. The beautiful cone-shaped volcano was supposed to have a vertical explosion. Instead, the mountain surprised everyone with a lateral explosion which tore a cubic mile of the NW face of mountain off, sending rock, dirt, ash, and snow thousands of feet into the sky, making the morning turn into night. The explosive ash moved in a northeasterly direction, carpeting Ellensburg, Yakima and other towns in Eastern Washington with a thick layer of fine ash. Travel was difficult, if not impossible due to the heavy ashfall in Eastern Washington. In those days, cars still had carburetors which required air to function. The heavy ash soon prevented cars from even moving, due to non-functioning engines and lack of vision. Some of my hiking friends were stuck on the east side of the Crest due to these problems, not reaching home for another day or so. The eruption/explosion of Mt. 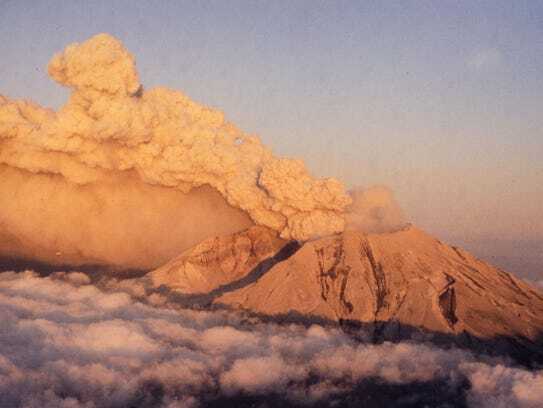 St. Helens occurred at precisely 8:32 PDT, on Sunday morning. And I heard/felt the explosion, even though I was next to a lively stream some 200+ miles to the north near Glacier Peak, in the North Cascades. My husband and I were co-leading a trip for a Seattle Mountaineer Backpacking class. At the time, I think we were co-chairs of the Backpacking Committee. The Mountaineers were our life. Most of our social commitments were with other Mountaineers, on trips, camping, backpacking, skiing, and staying at ski lodges and so on. We were camped on the North Fork Sauk River, a lively snow-fed stream that was in full spring-runoff. Nonetheless, we hear a loud denotation at around 8:30 a.m. but thought nothing of it. Nearby Oak Harbor Naval Station was notorious for allowing pilots to fly extremely low over the Cascade Range on training exercises, often popping off sonic booms as they crossed the ridges. Still, it was extremely odd for pilots to be out practicing early on a Sunday morning. We didn’t learn about the eruption of Mt. St. Helens until we got home in the late afternoon, safe and sound. My mother was frantic when I picked up the wall phone, “Are you all right?” And then she asked us to turn on the television for the latest news update. Remember, cell phones had not yet been invented and personal computers were still relatively rare. When I turned on the TV, there it was videos and photos of Mt. St. Helens and her ongoing eruptive phase… which claimed 57 lives and changed the landscape of SW Washington State permanently. Years later, I went on a backpack on the Loowit Trail, a trail that completely circumnavigates the mountain, or did during that time, around 2000. Even then, some 20 years after the eruption, the ground around the mountain was unconsolidated and subject to erosion. The trail was almost non-existent in some areas, around the stream “canyons” that had been carved out by water and wind. It was difficult to travel down the steep, loose, rock-filled ashy sides of the canyons and then to climb up again, with your own boots often cutting a route through the soft ashy soil. The trail was firmer and easier to follow through the wooded sections, but even then, the going was tough due to downed timber, large fir trees taken down by winter winds or perhaps from the ongoing earthquakes emanating from the movement of magma beneath the young mountain. When I got home, I had to thoroughly clean all my gear, myself and my vehicle as the fine volcanic dust penetrated every crack and crevice. What I also learned that even since I completed my backpack around Mt. St. Helens, the volcano has continued to erupt periodically, sometimes violently. She is a young volcano and presently the most active in the Cascade Range. She will erupt, again. It is just a question as to when, not if. Looking back on all those years spent out in Nature, I have an assortment of emotions come up for clearing. For one, my husband and I parted ways only about 4.5 years after Mt. St. Helens eruption. Although I joined the Mountaineers later in 1997, everything had changed. I was now taking care of my aging and ailing parents, working full-time, David was remarried, and I was finding a whole new set of friends and hiking companions. I had changed. I would continue to change. And when my parents passed, I left behind my old life. Still, once in a while, unexpected emotions come to the surface to be acknowledged, forgiven, and released. And now, I, “Sunny”, am doing this for my sister, Lady Taz, who has truly left her old life behind. Taz and I have often incarnated in Sirius and in the Pleiades, as twins. Our energetic signature is similar in that we have incarnated more often as males and when females tend to be tomboys. That perspective still holds true. I love geology and other physical sciences as did Taz while she was here. She also recognized the innate qualities of the natural world that are most often discounted or overlooked by scientists… that the Earth and all of her components are alive and aware. At times she felt a stone come alive under her hand, feeling much like an animal looking to be petted. And she recognized the sense of community, the interplay of life between animals and plants, as a living system. It hurt, literally hurt her to feel and see how few humans were truly tuned into the Earth. Perhaps this acute awareness was due to her lives as a Native American, but whatever it was, the feeling still resides within this body. People cannot seem to wrap their heads around the fact that I have never incarnated here before, yet it is so. And after I leave in some 19 or so years, I will not be returning. This is not my Home, yet I understand much about this planet due to my sister’s long residence here, through many lives, on all of the continents and some of the islands. The return of the Mother, of the Divine Feminine energy is a vital part of the current ascension and rebalancing of the planet. Yes, there will be Earth changes. These occur with every transitional cycle. Even though our present “leaders” have sought to bury our history, it is there recorded in stone, in buildings and in the Earth herself, as well as in the stories of the indigenous people scattered across the planet. The indigenous record-keepers have retained the verbal history of the planet for us and are now beginning to share it with outsiders since it is time… the time for change has arrived. The Light is returning to the planet, thanks to the sacrifices and work of countless and unsung lightworkers, through centuries of time, since before the Fall of Atlantis. Now is the time of the true heart-centered lightworkers to assist humanity into waking out of its collective nightmare, to receive healing, and to move into a future that holds the promise of peace and abundance for all life. Earth changes, in the form of earthquakes, volcanic eruptions, landslides, floods, fires and great storms will happen with greater frequency as the Sun moves through its solar minimum, but life will continue, perhaps in a greatly altered form. Be willing to adapt as the changes come for they will… as the ancient people of this planet who do remember know well. Stay in your heart and out of fear. Each of you is watched over, guided (if you allow and grant permission) and loved. Know that whatever happens, life goes on. No videos or recordings made from this material are permitted.